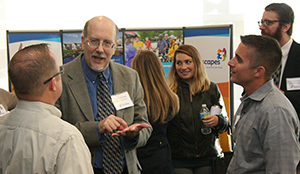 Earlier this month, over 40 local planners participated in our semi-annual Planner’s Forum. Planners from all disciplines networked to hear about the comprehensive plan update, creative funding opportunities, complete streets, and millennial characteristics. The presentations from the forum are now available. The forum kicked off with pastries, coffee, and introductions. Brian O’Leary, of the Planning Commission, then discussed Landscapes3 and how we have started the update process for the comprehensive plan. His presentation included some examples of how Landscapes and Landscpes2 have been beneficial for the County. Mark Gordon and Jason Lang, of East Goshen Township, explained how they obtained funding for the Paoli Pike Trail and provided best practices to keep in mind when applying for grants. Jeff Riegner of Whitman, Requardt & Associates, LLP discussed how complete streets provide economic, civic life, open space, environmental, public health, and safety benefits. He also provided before and after photos of San Diego, CA; Cary, IL; Austin, TX; Lancaster, CA; Hamburg, NY; and Pottstown, PA. Finally, Jake Michael, of the Planning Commission, explained how Millennials represent 25% of the County and how they differ from previous generations. Key findings from the Urban Land Institute 2015 Study were also discussed. The next Planner’s Forum will be held in the spring of 2017. Contact us if you have ideas for a presentation or would like to attend.